On location in Borneo shooting “Farewell To The King” – a story by Jeff Ramsey. 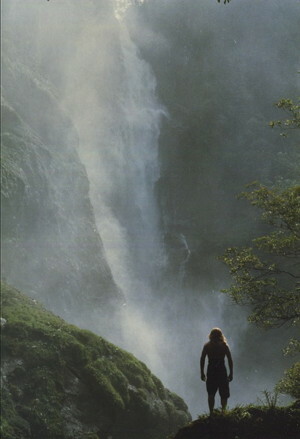 Borneo: Stuntman Terry Jackson looking out over the falls while doubling for lead actor Nick Nolte. 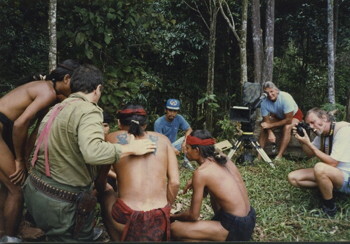 For filming on location, a second unit film crew was assembled and sent to far off Borneo to film important scripted scenes and before the 1st unit even began principle photography. The stunt coordinator was Terry Leonard and stunt double for Nick Nolte was Terry Jackson. Incidentally, the combined feature film and TV screen credits for both these gents number over 380 shows. So it goes without saying that the right men for the job were sent to shoot the necessary action sequences. Borneo – preparing a shot. According to records, the action sequences went off without a hitch and the small film crew came out of the high mountain jungles. 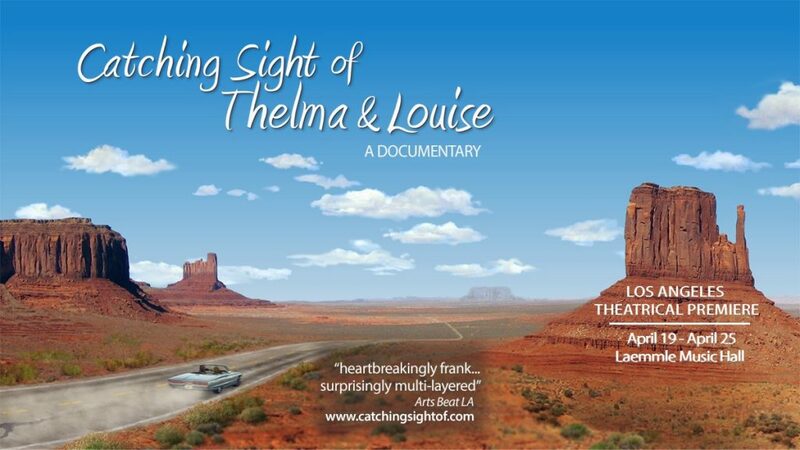 Yet both Terry Leonard and Terry Jackson stayed behind as guests of the natives who have lived in relative isolation in these highlands for immeasurable time. Here they find themselves, shooting film in the highlands of Malaysia where headhunters have lived for eons of time, completely disconnected from the outside world. 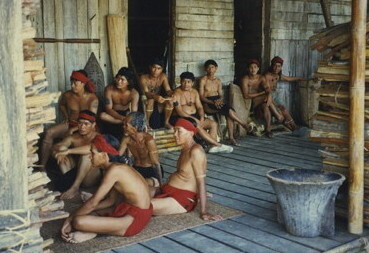 Borneo – tribes people lounging around bored. Well, the stuntmen could not very well turn down the gracious invitation. The feast of yams and roasted grubs were prepared especially in their honor and this feast was to take place in a long house high in the misty jungle mountains, thousands of miles from Hollywood, California. Lord only knows how the feast came off, because vague reports and rumors of what transpired began to filter out long after the celebration had concluded. It seems there exists among this culture a secret, exotic potion that tastes like sweet fruits and berries, yet this potion sends those who drink it into a deep zombie like condition afflicted by hallucinations. The imbibers have never lived to tell their tales. After a week of no sighting reports per the police in the city of Kuching, a team of investigators was dispatched to the mountains to discover where both Terrys could possibly be. Even today the police on this island maintain records of incidents of headhunters practicing their craft of shrinking human heads. Long ago the European settlers were thought to have stamped out that tribal ritual, yet these tribesmen are so isolated from any cities on the coasts, God only knows what still transpires hidden in those dense mists of East Kalimantan. The police spent weeks searching for the tiniest clue, but found nothing. The mountain villages held no trace, not one word of where they could be. No matter how much pressure was put upon the police on said island, the case simply ended up in the cold case files. Family members and friends here in the States could do nothing. 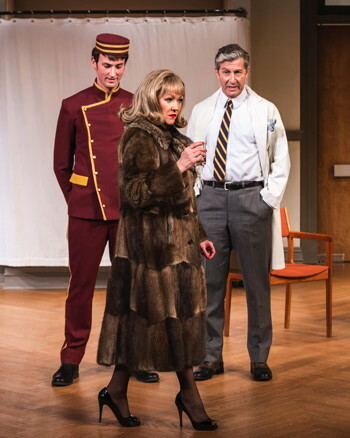 Twenty-five years later the renowned auction house in New York City, Sotheby’s, announced that they were auctioning off two rare and exotic items. According to their brochure, the auction of these rare items was set to begin with a minimum bid of $100,000. A select clientele of possible participants have received, via special delivery, the secret brochures for this exotic, one-time auction. Rumors abound that Stephen Spielberg, Clint Eastwood, Martin Scorsese, Quentin Tarantino, Joel Silver, James Cameron are just a few on the “special invitation” list. Bidding is rumored to be very high, and the media and the paparazzi were sure to be all over this elite event, but it was not the case; even they were left out of the loop. Thus far this has been hush, hush – I have it from good sources that this is top priority for Hollywood’s finest. Security was high and the bidding would not begin until all doors of entrance and exit were secured. With a resonant voice, the auctioneer loudly announced, “Ladies and Gentlemen, thank you to you all for traveling from as far off as California, China, Japan and many countries of Europe to bid on these rare items. “Oh my god!” A shock wave of gasps of horror and startled exclamation came over the room like tsunami. It was the shrunken heads of Terry Leonard and Terry Jackson! The auctioneer continued, “After twenty five years the mystery of the missing stuntmen was finally solved due to the dogged efforts of the detectives in Kuching, Borneo. Hundreds upon hundreds of square miles of remote jungle had to be searched and endless interviews with Dayak native and even tour guides that have led thousands of tourists throughout the remote territories, tourists who have come to see the diminishing Orangutan population. With aggressive logging for hardwoods by the Chinese and further intrusion into the lands of the Dayak, it was inevitable that someone would come forward with these two treasures. Backstory: During the evening of Thanksgiving, 2014 at the lovely home of Webster and Terri Whinery, as we all sat on the sofa in the living room, Terry Jackson proceeded to relate to us an animated and detailed account of his adventure in Borneo working with Terry Leonard as the stunt double for Nick Nolte on the feature film “Farewell To The King”, release date 1989. Story written by Jeff Ramsey. 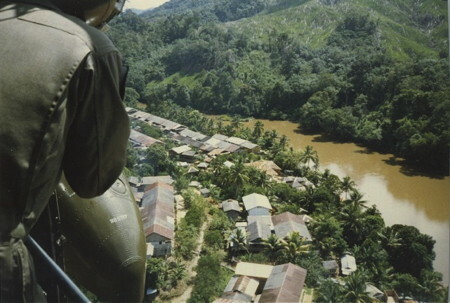 Borneo: Chopper shot over the village.